Wednesday January 23, 2019, from 5:00pm to 7:00pm, at Vini Wine Bar, 611 Second St. The Davis Downtown Annual Meeting and Reception offers a special opportunity for downtown business owners to mix and mingle while helping guide the future of downtown Davis. The meeting will begin at 5:00 pm with networking and socializing with Davis Downtown member businesses. Complimentary hors d’oeuvres along with hosted beer, wine will be available for attendees..
At this meeting we will provide an update on the activities of Davis Downtown, thank our exiting Directors, vote for new Directors, and celebrate the success of downtown Davis. Complimentary hors d’oeuvres and hosted beer, wine, and happy hour beverages will be available as well as a prize raffle. January 23, 2019, from 5:00pm to 7:00pm, at Vini Wine Bar, 611 Second St.
Network and socialize with Davis Downtown membership, Hosted beer, wine and complimentary hors d’oeuvres. 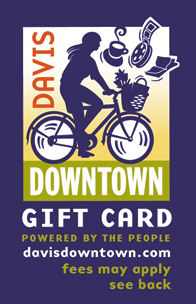 Davis Downtown is successful due to the energy and support of our many members. If you wish to have a positive impact on our downtown community, join us at one of our groups which meet each month.